DVD Synopsis: Deep in the Egyptian desert, a handful of people searching for a long-lost treasure have just unearthed a 3,000-year-old legacy of terror. Combining the thrills of a rousing adventure with the suspense of the legendary 1932 horror classic, The Mummy is a true nonstop action epic, filled with dazzling visual effects, top-notch talent and superb storytelling. I think the reason why I have such a good time watching The Mummy is that the film’s main characters are so unlike the heroes you’d find in most adventure films. In short, these people are almost completely incompetent. 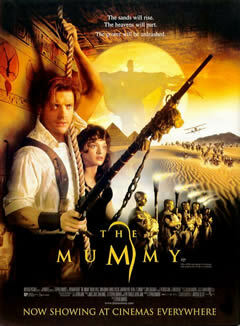 O’Connell (Brendan Fraser), the ‘hero’ of the story, is an adventurer, but he’s not a very good one. At one point, Evelyn (Rachel Weisz) has to save him when he’s sentenced to hang for drunkenness and public fighting. Then there’s Evelyn herself, who works as a librarian for the Cairo museum. In a well-choreographed scene, we watch as she clumsily knocks over every bookshelf in the room domino-style, sending thousands of books crashing to the ground. Her brother, Jonathan (John Hannah), a self-proclaimed ‘explorer’, is in reality a drunken fop whose most amazing archaeological discovery was made in a bar. Even the supporting characters aren’t much to write home about. On the way to Hamunaptra, O’Connell and company meet a trio of gun-happy Americans who are also searching for the lost city’s treasure. They’re led by a weasly little man named Beni (Kevin J. O'Connor), who O’Connell knows from his days in the army when Benni’s cowardice almost got him killed. Each of these characters is comically inept, and we’re left questioning whether or not they can read a map, let alone find the lost city of Hamunaptra. The special effects and exciting action sequences make The Mummy an electrifying film, but it’s the hilariously incompetent cast of characters that makes it an endearing one. I like this movie because of the characters as you said. I find them very amusing and the film overall is very light and humorous. Either Cody Clark needs to read this review or you need to visit the MPW comment boards because there is a war going on over this movie. I like this movie quite a bit. I think it accomplishes exactly what it sets out to do, which is entertain the hell out of you. Nothing more, nothing less.